Stones believed to be part of a giant arch that used to stand at Euston railway station are being retrieved from an east London waterway. The 70ft Grecian arch stood at the front of the station for 123 years until its destruction in 1962. The stones are being lifted from the Prescott Channel, where they were used to fill a hole in the riverbed. Campaigners want to reconstruct the arch using as much of the original stone as possible. The arch was demolished by the British Transport Commission when the station was redeveloped in the 1960s. British Waterways will lift the stones from the channel, near Bromley-by-Bow, on Monday to enable barges to use the lock to transport materials in and out of the Olympic Park for the 2012 Games. Historian Dan Cruickshank described the arch as "the first great building of the railway age" and said its destruction was an "act of barbarism". He is a member of the Euston Arch Trust, which wants to rebuild the arch between two existing lodges on Euston Road. Mr Cruickshank said: "The careful raising of a number of its stones - a magnificent gesture on the part of British Waterways - moves the rebuilding campaign forward significantly and means that a great cultural wrong committed in the 1960s can yet be put right." 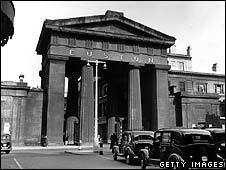 Can the Euston arch rise again?